Sergeant Orrlando Mayes with the Sacramento County Sheriff’s Department is the 2017 recipient of the Mark Dunakin Memorial Award for Extraordinary Achievement. The 25-year law enforcement veteran is humbled by the honor. “I am grateful to be considered in the same league as Sergeant Dunakin,” said Mayes. 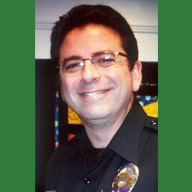 The Mark Dunakin Memorial Award was established to honor the memory of Sergeant Dunakin, a UI&U student who tragically lost his life on March 21, 2009, at the age of 40, when he and three other Oakland police officers were killed in the line of duty. 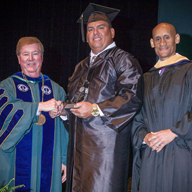 The award is presented to a new graduate of the Union Institute & University Sacramento Academic Center Criminal Justice Management program who serves in law enforcement and who emulates Sergeant Dunakin’s commitment to community service, academic success, and enthusiasm for Union’s Criminal Justice Management program. The faculty noted Mayes was a perfect match for the criteria, particularly in his thoughtful approach and his desire to go above and beyond in everything he does. 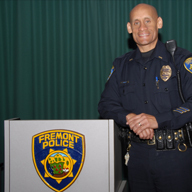 Sergeant Mayes currently serves as the Academy Director for the Sacramento Sheriff’s Academy. Prior to being promoted to sergeant, he spent 14 years on the SWAT team as the Assistant Team Leader. As sergeant, he remains active as an auxiliary SWAT team member. 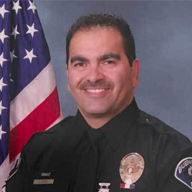 In 2010, Sergeant Mayes was involved in one of California’s longest hostage standoffs, during which he participated with his team to help save the life of a 16-month-old child after 56 hours of intense negotiation. He was recently reunited with the child, who has said he wants to be a police officer just like Mayes. And, the child’s uncle, who was deployed overseas with the military at the time of the standoff, was so inspired by the officers’ work that he is now a deputy with the Sacramento County Sherriff’s Department.